Gather around, all you skeptics, all you naysayers, all you nattering nabobs of negativism who have fallen victim to the misguided notion that dinosaurs are extinct – for I am about to tell you a tale that will forever change your opinion about the whole matter. 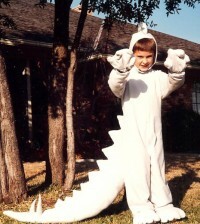 It concerns a little stegosaurus who roamed the earth eons ago, which in this case was somewhere around 1986. Of course most stegosauruses are hatched from eggs, but "Steggy” as he was affectionately known, was actually conceived in a fabric store, gestated for about a week in the sewing room, and finally brought to life fully stitched and stuffed just three days before Halloween. From the moment he beheld himself in the mirror, little Steggy knew he was special. His pale gray coat was soft and warm, and he had round little clawed mittens and two big puffy feet. There were pointy plates running from the top of his head, all the way down his back, and right to the end of his big massive tail. Speaking of his tail, not surprisingly it was Steggy's pride and joy, especially the two long spikes. After all, those were what made him so… SCARY!! For the first three days of his life he pretty much just swaggered around the house, practicing his ferocious "R-ARRRRRRR” and knocking over potted plants with his tail. But then came Halloween night and the real fun began. First he joined a bunch of other creatures on the front sidewalk – a group that included a space alien, two super heroes, one guy in a business suit with a Henry Kissinger mask, and a mummy covered in ketchup. For a full two hours this merry band of Trick-or-Treaters prowled the neighborhood, amassing vast quantities of Skittles and Tootsie Roll Pops. Then it was on to the elementary school carnival for some hot dogs, ring tosses, cupcake walks and a chance to dunk the Principal in the dunking booth. Throughout it all Steggy was the hit of the evening, and except for a single unfortunate moment when he was denied entry to the Bounce House because of his enormous tail, it was a night of pure magic. The sight of lit jack-o-lanterns and creepy ghosts and goblins; the smell of popcorn balls; the sound of recorded screams coming from the Haunted House; the heady rush of sugar through the bloodstream – Steggy wanted it all to go on and on forever. But it didn't. Nine o'clock came and he suddenly found himself tossed dejectedly onto the back of a chair. Within an hour the room was dark, the house was completely quiet, and everybody was asleep. It was all over. The next day he awaited the pleasant ritual of roaming noisily through the house again, but it never happened. Instead he was stuffed into a giant black plastic garbage bag, crammed down into a big box and carted off to the attic. Over the years the more the man threatened to toss Steggy's box, the more fiercely the woman fought to hang onto it. All the while Steggy consoled himself with memories of that one magical night. He had no way of knowing this (after all, no one had thought to give him a wristwatch), but a full twenty-five years passed. Then one day his box began to tumble and roll, and from the sound of things it was evident that he was being shipped through the mail! Two days later, he landed with a thump. 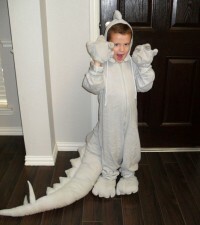 He overheard someone say, "Aidan, this was Uncle Jason's costume when he was just your age!” Then to Steggy's joy and astonishment he was retrieved from the box, given a refreshing shake to remove the wrinkles, and brought to life again! Once again he faced himself in the mirror. His face was a little different, but everything else was the same – his puffy hands and feet, his pointy plates and that magnificent tail with its two fabulous spikes. Instinctively he let out a ferocious "R-AARRRRR!” and accidentally knocked over a nearby trashcan. But there was no time to worry about that now. The Jack-o-lanterns were being lit. It was Halloween night – and Steggy couldn't wait to be part of it! So there now. Don't you feel silly for believing that nonsense about dinosaurs being extinct? Search for Holidays articles similar to "The Stalwart Stegosaurus. Search all articles similar to "The Stalwart Stegosaurus".